Health organizations have benefitted from policy changes in the new administration—such as proposed funding cuts causing increased donations. Others are anxiously monitoring legislative developments related to the Affordable Care Act. 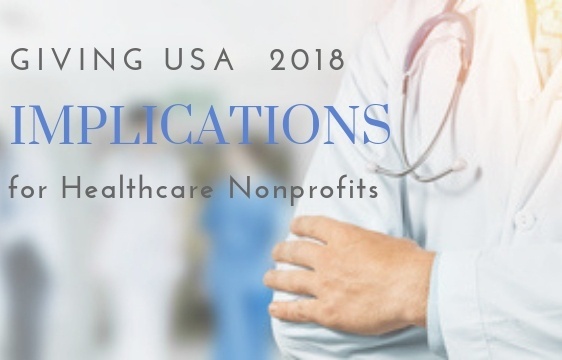 In particular, hospitals’ tax-exempt status is being discussed again; in a precedent case in 2017, the IRS revoked the nonprofit status of a hospital for failing to meet the needs of its community for charity care. The end of the individual mandate to carry health insurance has caused some hospitals to anticipate a nationwide increase in uninsured patients as well as uncompensated care. In response to the opioid crisis and other significant mental health issues, 2017 brought an upsurge in philanthropic funds dedicated to innovative efforts related to mental health. In particular, nonprofits that have received little government support historically and those impacted by recent policy changes have benefitted from increased giving. Pursue individual major gift donors as well as corporations and foundations. While corporate/foundation gifts to health organizations (27.9 percent) edged out major gifts (24.3 percent) as the largest source of philanthropic dollars in fiscal year 2016, according to the Association for Healthcare Philanthropy’s 2017 annual Report on Giving, individuals continue to be the largest source of contributions across all sectors. Cultivating relationships with both individual major gift donors and corporate and foundation prospects can help them to see the impact of their dollars on health in their communities. Mark Larkin, CFRE, AHP board member, remarked, "During this time of unprecedented change in health care, extraordinary giving is so important to the care we provide to our communities every day. The Report on Giving is encouraging because these dollars translate into life-saving technology, promising new research, and the best possible care for our patients." Continue to invest in online giving. Donors continue to utilize online giving in increasing numbers, with another 11.5 percent increase in the past year, according to the Blackbaud Index sample of healthcare organizations. Another study, Benchmarks 2018 by M+R and NTEN, found increases of more than 20 percent for monthly and one-time donors, despite a slight drop in gift size. Clearly online giving is an area of growth, and organizations can capitalize in various ways, including: 1) ensuring your website adapts well to mobile devices; 2) creating email appeals that are easily read on various platforms; 3) capturing contact information of patients and visitors who use your Wi-Fi network to screen for potential prospects; and 4) investing in experienced staff or vendors to continue to develop the technology for successful online giving. Develop alternatives to traditional peer-to-peer fundraising. For the fifth consecutive year, “a-thon” events have declined in revenue, with a drop of 6.7 percent in 2017. Large organizations are downsizing their efforts for increased efficiency, with fewer event sites—and some are seeing larger amounts raised per participant. Another tactic is to diversify the events to encourage engagement of different groups (e.g., the American Cancer Society’s “Real Men Wear Pink” campaign). Events have their place—but take a hard look at your return on investment. Variations or a new approach may make more sense to engage more and/or different donors and reach your revenue goals.